Subject: Plate : 'Naturel et chef de Vanou - Vanikoro.' (A native and a Chief from Vanou on Vanikoro island). 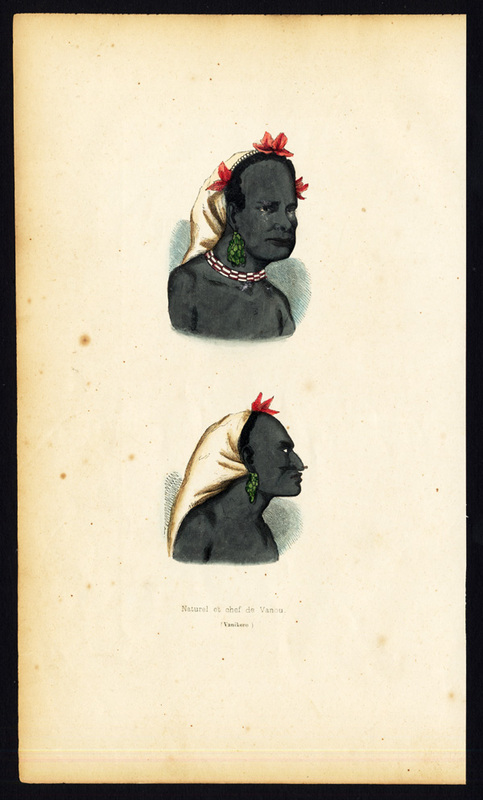 This plate shows natives from the island of Vanikoro, one of the Solomon Islands. Size (in cm): The overall size is ca. 15 x 25.5 cm. The image size is ca. 5 x 16.5 cm. Size (in inch): The overall size is ca. 5.9 x 10 inch. The image size is ca. 2 x 6.5 inch.